This article provides the detailed, practical information that is useful to anyone planning a trip to the Galápagos Islands. As a general rule, changes in the Galápagos can occur daily and there is often no way to predict them until they happen. National government elections can bring in a leader with a different agenda. The Director of the Galápagos National Park and the Galápagos Marine Reserve can be replaced unexpectedly, leaving projected programs up in the air or changing existing rules and regulations. Everyone familiar with the Galápagos knows that what is true today may not be true tomorrow, and they must keep their feelers out at all times to be ready to adapt as modifications occur. Likewise, visitors must always be aware of the real possibility of last minute changes. Nevertheless, everything usually gets resolved in the end and the Galapagos is one of the most fascinating places on earth. Tourists visit the Galápagos for a variety of reasons, including: diving, birding, general nature hikes, photography, and scientific research. Most tourists opt for one of three basic kinds of tours: Day trips returning to the same hotel each night, hotel-based trips staying in lodgings on different islands, and live-aboard yachts/ships. Because of recent Park Rules and restrictions, there is a great deal more emphasis on land-based tours, however to get the most out of your time in Galapagos, I would recommend a yacht/ship based trip. When planning a trip to Galapagos, many people will use the services of an experienced travel company that truly understands Galapagos rather than attempting to book their trip on their own. 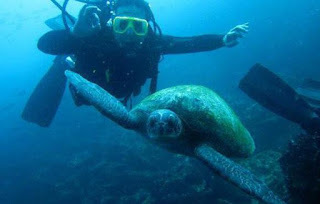 Many companies will claim to be experts in Galapagos when in reality they have little experience with the destination and no established connections in Ecuador. The services of these companies are free to their clients as they are all paid a commission from the various operators in Galapagos.